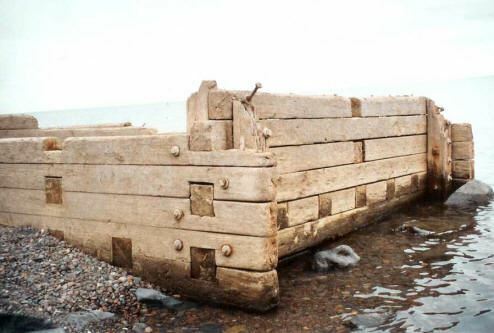 A large timber crib structure washed ashore during a late November storm in 2006. The crib rests at the edge of the rocky shoreline near the Duluth Vietnam Veterans Memorial by the Lakewalk near Fitgers. It is thought that the crib may once have been part of the old harbor breakwater that extends at an angle out from the Vietnam Veterans memorial to a red nun buoy off shore. Minnesota Department Transportation (MNDOT) had some safety concerns about the crib near shore and was making plans to remove it. The Minnesota Historical Society (MHS) wanted them to delay their action until the historical significance of the crib could be determined. 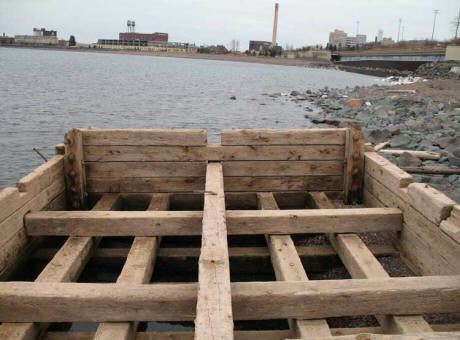 Duluth Mayor Bergson had expressed that the city wanted to evaluate the potential of using the crib as a waterfront historical artifact. They are considering permanently anchoring it to the shoreline, as well as potentially preserving it and providing interpretation of the structure. The old harbor breakwater, referred to as the outer harbor, was built parallel to Minnesota Point in early 1870 to provide protection for ships loading and unloading cargoes of coal or grain. 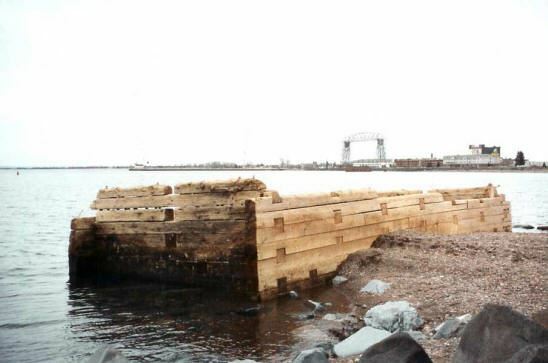 The breakwater was built before the Duluth Ship Canal was dug across Minnesota Point. According to old Duluth newspaper records at the Minnesota Historical Society, several storms washed out sections of the cribs in the early 1870s. Some sections of the damaged breakwater were repaired, but a very big storm in 1873 caused considerable damage. Two new cribs were placed in the water and filled with stones, but the structure was limited to 200 foot long, with a stone road on top. Thom Holden, director of the Lake Superior Visitor Center in Canal Park photographed and documented many details of the crib that had washed ashore. 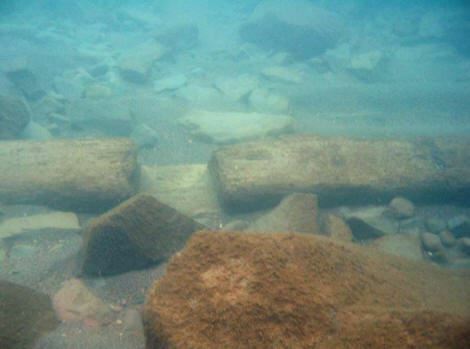 Because of the very good condition of the crib, the Minnesota Historical Society was interested in determining whether it came from the old harbor breakwater or some other underwater location. 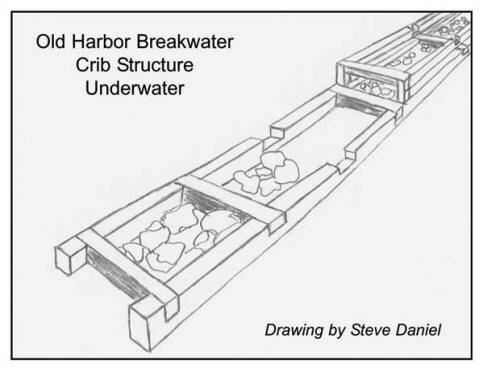 The MHS also wanted to determine if the old harbor breakwater cribs may be eligible for a nomination to the National Register of Historic Places The GLSPS was asked to conduct an underwater survey and compare the size and construction of the timber cribs underwater to the crib on shore. 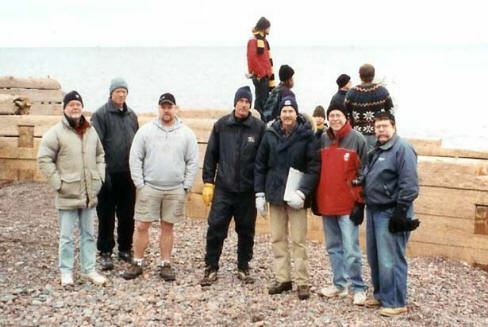 The Duluth Chapter was asked to help with the project on Saturday, January 6, 2007. Jay Hanson, owner of Superior Scuba Center and a GLSPS member, gathered several of the Duluth Chapter members to help. Dave Wakefield and Thom Holden took numerous pictures of the crib and the activity involved in the documentation. 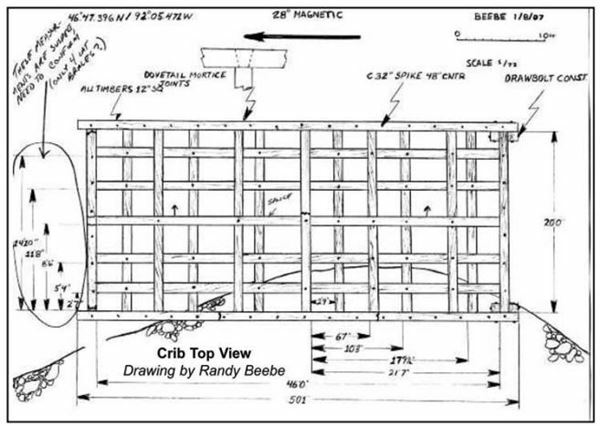 Randy Beebe recorded measurements and drew a top view of the crib structure. Jay Hanson and Bill Sanders were divers who took photos of the crib structure underwater. Steve Daniel and Kevin Helquist were divers who measured sections of the structure underwater. The 37 degree water temperature did not hamper their efforts, as the divers wore drysuits for protection. The group concluded that the crib on shore, which measured 20 feet by 50 feet, was different that the long line of cribs in the water. 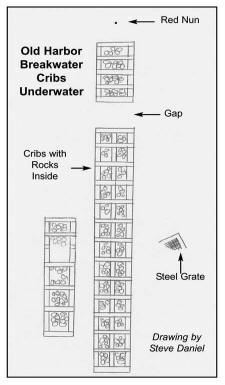 The underwater crib sections measured 30 feet by about 50 feet. The dive teams found 14 crib sections underwater in the long row and four crib structures underwater at the deep end after a gap. 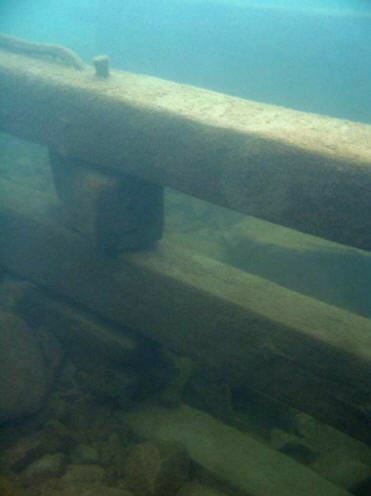 The total length of the underwater cribbing, including the gap, measured roughly to be 901 feet. 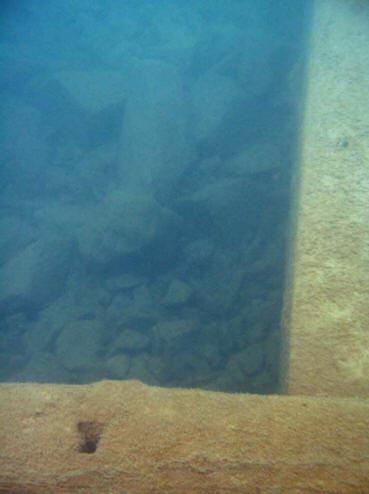 The divers checked out a series of cribs alongside the long row and found the base structure to be intact. The divers also measured the opening at the end of the long row of cribs to the short run by the buoy and found the distance to be 55 feet. Both Hanson and Daniel had dived the cribs years before and did not recall any cribs or signs of crib debris being in the gap. The group concluded that the crib on shore must have come from another underwater structure. 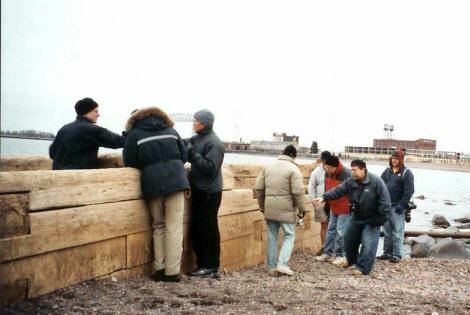 The group was going to consult Elmer Engman, a Duluth diver who dove a section of cribs extending along the shoreline east of the old harbor breakwater many years earlier. 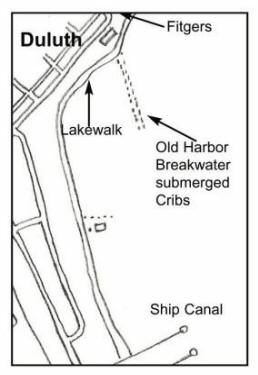 The cribs are thought to be perpendicular to the old harbor breakwater structure and were probably used for a dock behind Fitgers. Jay Hanson plans to gather the Duluth group for another dive to measure the second group of underwater cribs, weather permitting. Another possibility for the origin of the shore side crib was thought to be the site of the shipwreck of the Crescent City. The ship was blown aground near shore by Lakewood Road, north of the Lester River during the horrific Mataafa Storm in 1905. Cribs were built to conduct temporary repairs on the ship to help get it refloated and back to deeper water. The cribs were thought to have been abandoned in the water afterwards. It may be possible that a crib shook loose its rock contents and floated four miles down the lake in the November storm to the shore location. This site may be considered for a potential dive at another date. 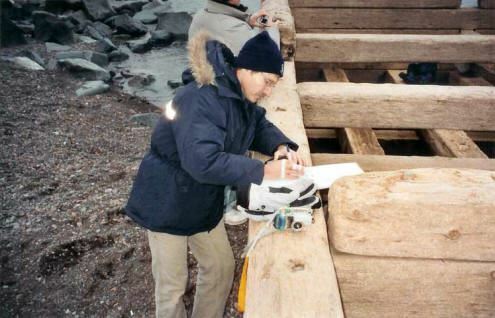 Randy Beebe records measurements and draws construction. Inside of crib showed strong interlocking timbers. Dove tail slots were carved out of the timbers. 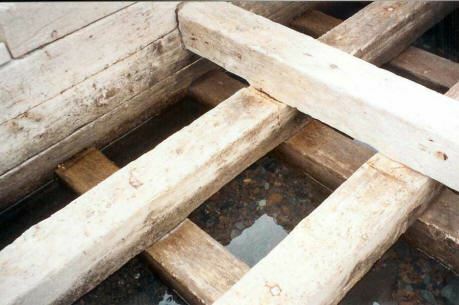 Twelve-inch square timbers crossing appear like a large lattice. 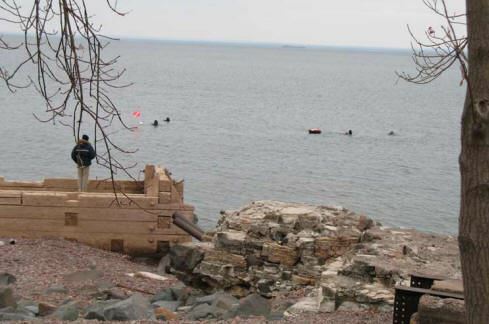 Dive teams check out underwater crib structure of old harbor breakwater. Timbers are locked in place with dove tails and large bolts. Documentation Crew: (l-r) Dave Wakefield, Bill Sanders, Jay Hanson, Kevin Helquist, Randy Beebe, Steve Daniel and Thom Holden. Thom and Jay examine 12 inch timber with Randy drawing in the background. Corner shows detail of dove tails and bolts used to secure the timbers. 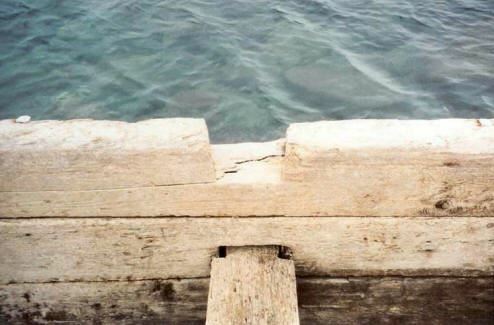 Dove tail slot is evident in underwater timber in old harbor breakwater crib structure. 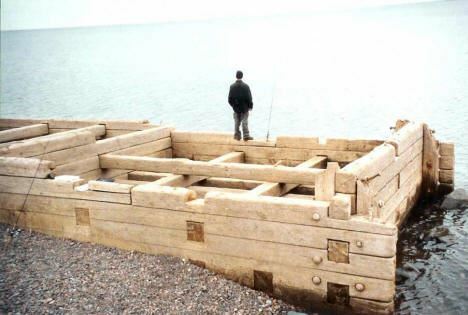 Structure underwater resembled the shore side crib, but was wider and much more weathered in appearance. Hole is evident where bolt was once fastened through a timber.